In August, I started low-dose chemotherapy to treat my Crohn’s Disease; and though it is exhausting, it is going well. I was nervous about today’s infusion because I have difficult veins to find and I was pretty sick a couple of weeks ago. Plus, I had a low-grade fever today, so I was worried they’d say I wasn’t well enough for the appointment. The drugs knock out my immune system, which helps with my Crohn’s symptoms, but also means something simple like a cold can escalate quickly. Today’s #OneGoodThing was completing my 5th round of Crohn’s chemo. Special thanks to my friend and faithful chemo buddy, Kelley, for driving me and helping me! Day 10 of 365. And Day 741 in a row (here’s the first 366 & the following 365)! Praying for the chemo to work quickly and effectively! Thank you Lys! My GI doc is hoping I might be able to stop the chemo in a year. That’s miraculous news as some Crohn’s patients are on this chemo for life. Hi! I didn’t know you had crohn’s. My mom has it too. I’ve not heard of using chemo to treat it. Good luck to you. I wish you all the best. Thanks Sarah! My Crohn’s treatment began with handfuls of pills but it still didn’t cut it. It was like having food poisoning and stomach flu and hangover all at once and around the clock day after day! Absolutely miserable! So my GI doc put me on this low dose chemo, which is helping but hasn’t cleared up my flare completely. It is common among Crohn’s patients and will hopefully help me avoid any terrible surgeries! I hope your mom is doing well. This disease is awful! Sending you big hugs Sarah!!! 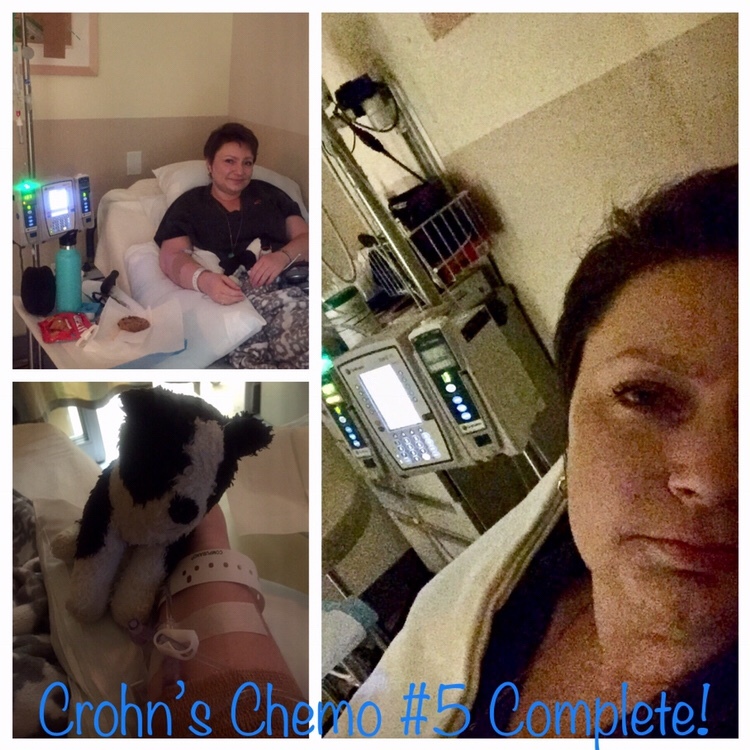 I’ve had Crohn’s for 35 years and have never heard of it being treated with Chemo. I’ll be watching your posts as I am curious about this. I hope you’re able to find some relief, Jim.